STOW — Barbara Bosworth spent the summer and fall last year hiking and photographing the New England National Scenic Trail, lugging her boxy 8 x 10 view camera and tripod into woods and along streams surrounding the Connecticut River. Bosworth, the trail’s first artist in residence, knew that its many spectacular views were only a small part of the picture. Now an exhibition of her work, “To Be at the Farther Edge: Photographs Along the New England Trail,” makes its own kind of trail through the Connecticut River Valley, with one spur out to Boston. 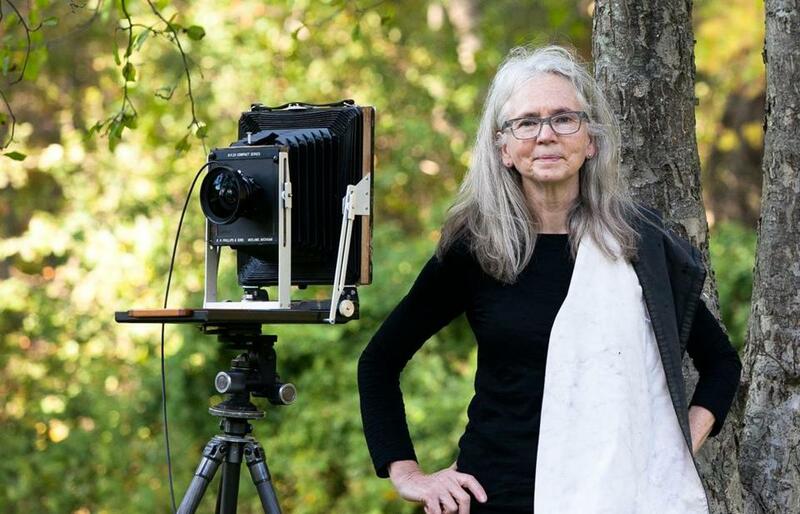 Her color photographs can be seen in eight venues near the trail, and also at the Appalachian Mountain Club headquarters on Beacon Hill. The pictures document traces people have left along the path. They examine geological and man-made marks. They contemplate the clouds, and take viewers over a creek and down a gully. They revisit scenes blazoned into art history by Hudson River School painter Thomas Cole. In 1836, Cole likely bushwhacked to an overlook on one ridge to paint “View From Mount Holyoke, Northampton, Massachusetts, After a Thunderstorm — The Oxbow.” In it, a curtain of thunderclouds dramatically gives way to clearer skies over a glittering loop of river. Bosworth had no interest in re-creating the scene, she says. But she wanted to acknowledge it. She climbed to a nearby ridge, Mount Tom, and photographed the oxbow from there, at different times of the day and season. She and a friend left her home in Stow at 1 a.m. one September night to get up Mount Tom before dawn. They picked up Bill Finn, one of Bosworth’s many guides along the trail, at 3 a.m. Wearing headlamps and moving slowly beneath the weight of camera and tripod, the hikers arrived in the dark. “It was quite the adventure,” Bosworth says. Her photograph, “View of the Oxbow From Dry Knob (Just Before Daybreak),” is a moody, luminous, deep-blue triptych with lights from the Oxbow Marina in Northampton glowing softly at its center, framed by trees’ black silhouettes. The large-format prints, exquisite with detail, explore the social and natural history along the way. The 215-mile trail was actively developed in the 1930s in Connecticut and the 1950s in Massachusetts, but it was only designated a National Scenic Trail in 2009, thanks to vistas such as those captured by Cole, who also painted “View of Monte Video, Seat of Daniel Wadsworth, Esq.” a Connecticut vista along the trail. There are only 11 National Scenic Trails in the United States. “You feel like you can walk into these photographs,” says Charles Tracy, National Park Service superintendent of the New England National Scenic Trail, who tapped Bosworth for the artist-in-residence position. He met her seven years ago, when he booked her for a residency at Marsh-Billings-Rockefeller National Historical Park in Woodstock, Vt.
“I was struck by how her work focuses on landscape and people, and their connection,” he says. Tracy has a second role with the National Park Service: He helps facilitate artists working in parks around the country. Of the approximately 400 national park sites, about 50 have artist-in-residence programs. “Connecting art with the environment is a great way to encourage people to look at the landscape differently,” he says. Bosworth’s project falls into the tradition of landscape art, which shares many elements of “trail-ness.” It’s all about how people relate to the land. Painters such as Cole shaped ideas about nature and spirituality into landscapes. The works of Hudson River School painters sparked tourism, and helped ignite the conservation movement and the creation of the National Park Service. For the artist, who had a solo exhibition, “Natural Histories, Photographs by Barbara Bosworth,” at the Peabody Essex Museum last year, a fascination with nature came down the family line. Growing up in Novelty, Ohio, she was bred on natural beauty. That passion goes back generations. Bosworth treasures an egg collection put together by her great-grandfather. As a child, she studied it with Darwinian attention. Her grandfather frequently painted the stream that ran in the woods behind the house where she grew up. She’s been working on a side project for the last decade documenting a meadow in Carlisle, in partnership with writer Margot Kelley. “We bring scientists to the meadow to look at it through other perspectives,” Bosworth says. So far, they’ve had a firefly expert come by, and an ant researcher. Bosworth and Kelley are also investigating the meadow’s human history, and hope to publish their work in book form. In the end, Bosworth is a lot like her painter granddad, and Thomas Cole, and the hikers who stop along the vistas of the New England Scenic Trail to gaze before they pull out their smart phones and snap a picture. It’s not just the beauty of the place; it’s that they witnessed it.